In last couple of articles, we have learned about pre-order and in-order tree traversal in Java and today, you will learn about the post order traversal in binary tree. The post order traversal is also a depth-first algorithm because you go deep before you visit other nodes in same level. In post order traversal, you first visit left subtree, then right subtree and finally you print the value of node or root. That's why the value of root is always printed last on post order traversal. Like many tree algorithms, the easiest way to implement post-order traversal is by using recursion. In fact, if you know how to write pre-order using recursion, you can use the same algorithm with bit of adjustment to implement post order traversal. All you need to do is instead of printing the value of node first, just call the recursive method with left subtree as shown in our example. Unlike in-order traversal which prints all nodes of binary search tree in sorted order, post-order doesn't provide sorting but its useful while deleting nodes from binary tree, see a good book on data structure and algorithms e.g. Introduction to Algorithms by Thomas H. Cormen to learn more about different usage of post-order traversal in Computer Science and programming. The recursive algorithm is very easy to understand as it exactly similar to the recursive preOrder and recursive inOrder traversal. The only thing which is different is the order in which the left subtree, right subtree, and root are visited or traversed as shown in following code snippet. You can see that algorithm is exactly similar to pre-order algorithm except for the order of traversal to root, left sub-tree, and right subtree is different. In this code, left subtree is visited first, the right subtree is visited second and value of the node is printed third. If you want to learn more about the recursive post-order traversal algorithm e.g. it's real world examples and complexity assesment, I suggest you to take a look at Algorithms 4th Edition by Robert Sedgewick, one of the best data structure and algorithm book for Java developers as examples are given in Java programming language. Here is the complete Java program to print all nodes of a binary tree in the post order traversal. In this part of the tutorial, we are learning the recursive post order traversal and next part, I'll show you how to implement post order algorithm without recursion, one of the toughest tree traversal algorithm for beginner programmers. Similar to our earlier examples, I have created a class called BinaryTree to represent a binary tree in Java. This class has a static nested class to represent a tree node, called TreeNode. This is similar to the Map.Entry class which is used to represent an entry in the hash table. The class just keep the reference to root and TreeNode takes care of left and right children. This class has two methods postOrder() and postOrder(TreeNode root), the first one is public and second one is private. The actual traversing is done in second method but since root is internal to the class and client don't have access to root, I have created postOrder() method which calls the private method. This is a common trick to implement recursive algorithm. This also gives you luxury to change your algorithm without affecting clients e.g. tomorrow we can change the recursive algorithm to an iterative one and client will still be calling the post order method without knowing that now iterative algorithm is in place. * using postOrder traversal without recursion. * and finally data of root or current node is printed. That's all about how to implement post order traversal in Java. 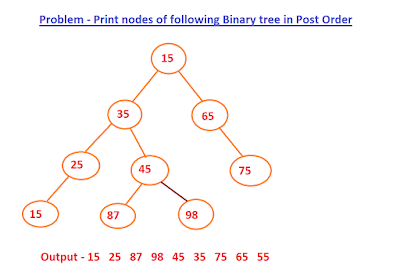 You can use this algorithm to print all nodes of binary tree in post order. Just remember that in post order traversal, you first visit left subtree, followed by right subtree and finally value of node or root is printed. This is also the reason why root is printed at last on post order traversal. 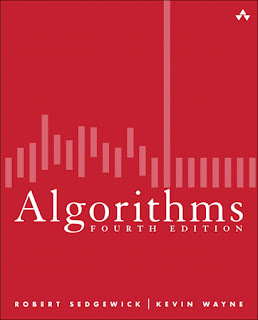 If you want to learn more about post order traversal or other binary tree algorithms, I suggest reading either Introduction to Algorithms by Thomas H. Cormen or Algorithms 4th Edition by Robert Sedgewick, both are great books to learn Data structure and Algorithms. Your tree structure is not drawn correctly in image as well as javadoc, with respect to coding. Yeah, thank for pointing it out, I'll correct it.